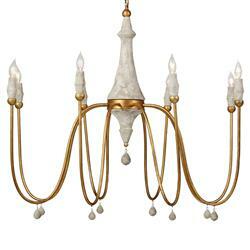 Make a grand statement in a dining room or foyer with this fabulous eight-light chandelier. Distressed cream colored accents dangle like charms from the arms and center column, drawing attention to the elegant silhouette. With rustic and polished finishes, this chandelier is a truly transitional piece.